All the above methods feature an initial step that involves the reaction of monomers to produce a pre-polymer. The pre-polymer that is formed is then reacted in various ways using the different methods to give the fibers. Of all the above-listed methods, the solution dry spinning is the most common and produces approximately 94.5 percent of the world’s spandex fibers. The first step produces the pre-polymer by mixing diphenylmethane diisocyanate monomer with micro polyester in a reaction vessel. Next, the prepolymer is reacted with a diamine of equal amount. The product is then mixed with a solvent to dilute it and give it a spinning solution. After dilution into a thinner solution, it’s then pumped into the fiber production cell. The spinning solution then goes into a cylindrical spinning cell. It’s then forced into a metal plate called a spinnerette. Here, it’s cured and turned into fibers. The strands are heated in the presence of nitrogen and solvent gas; this is the process that causes the liquid polymer to react chemically and form solid strands. The strands are bundled to form fibers of the desired thickness as they exit the cell. 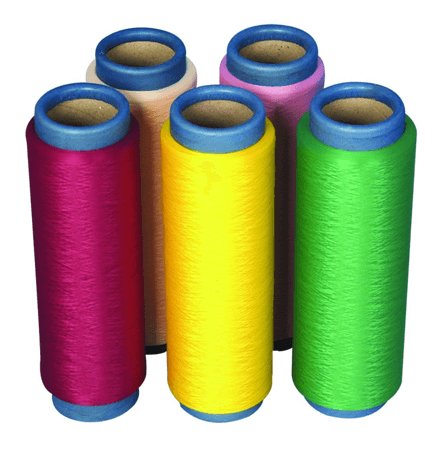 A single fiber is made up of multiple smaller individual fibers. The resulting fibers are treated with a polymer such as magnesium stearate to prevent the fibers from sticking together. The multifilament fibers are more absorbent than the monofilament fibers.